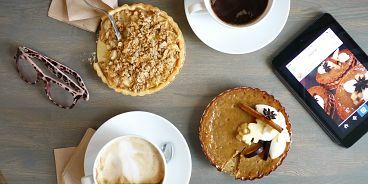 If you’re hunting for seriously good fall-inspired desserts for a party or a work event, head to Cadeaux Bakery in Strathcona Village’s Railtown where award-winning pastry chef Eleanor Chow is master of the seasonal tart, among other creations. She’s got pumpkin tarts, caramel nut tarts, pumpkin caramel eclairs, and my all-time favourites, oh so creamy apple tarts, which are topped with an incredibly decadent buttery crumble. If you prefer to indulge solo over a hot cup of coffee, head in to Cadeaux’s cafe where you can enjoy your fresh-baked treat along with the smells of cakes baking, or grab your dessert to go to enjoy it overlooking the ocean at nearby Crab Park. If you need a birthday cake, Cadeaux is also the master of beautiful icing. You can choose from their four cake flavours: london fog, vanilla bean, chocolate, and dark chocolate praline.